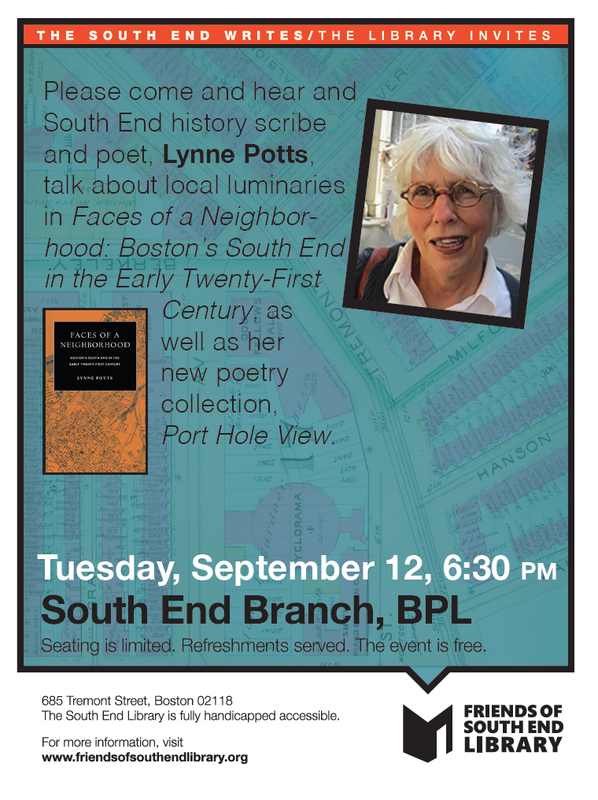 Lynne Potts, Poet and History Scribe from Holyoke Street, Tells the Audience She Looked for Years for "a Place to Belong"
South End author and poet, Lynne Potts, had just published A Block in Time: History of Boston's South End through a Window on Holyoke, when she unexpectedly found herself interviewing Southenders for another book, one that became Faces of a Neighborhood: Boston's South End in the early 21st Century. "It was a curious process," explained Potts to a full room of interested listeners at the South End library in mid-September. "I only knew the people on my street, but they gave me some names and then I got some more names." Two years later, she had an amazing list of interviewees, including an octogenarian, a shop owner, a Villa Victoria resident, a concierge and an international arbitrator and mediator. "It was such an exciting range of people," Potts said. "I'd ask them, 'would you mind if I interviewed you about your life in the South End?' and most of them stayed with it." Faces includes twenty-five interviews of the Southenders about whose lives she began to speculate when walking through local streets and observed the various domestic scenes visible across the lit windows of early evening. Potts's other explanation for the genesis of Faces was, in part, that she didn't quite know where she herself belonged in the landscape of her life, but knew that she wanted to belong somewhere. From growing up in Michigan to a marriage that took her to Berkeley, CA, then to a farm in Vermont, and next to an apartment on West Rutland Square as a divorced mother of young children, she found a home on Holyoke Street --where she still lives-- but never quite knew what emotional geography she was a part of. "I found myself talking to people who were clear about who they were, who had found themselves," she said. "My project became a series of little sagas, explanations of who they were and who they became. Almost all those I talked with identified with the South End's amazing cultural history, its architecture, its art, the way it was accepting of diverse sexual identities." The South End's demography in the 1980s was a rich brew of the Irish, Lebanese, Jews, African Americans and Greeks. Fifty-six percent was Caucasian; 16 percent African American. "We were proud that people from so many different walks of life lived in close proximity to those who were so different," Potts commented. The author, whose delicate stature belies an intensely engaged and observational presence, said she had written and published poetry for the last 15 years, after obtaining an MFA from Columbia University. 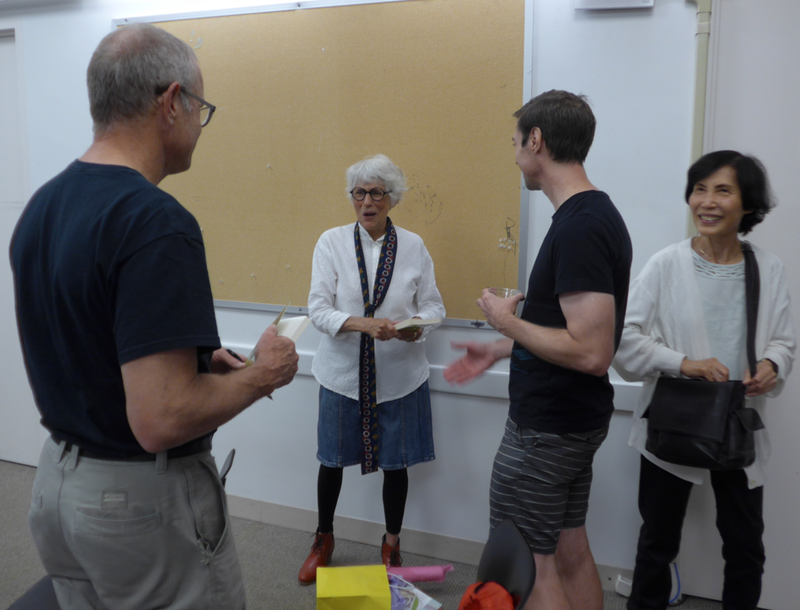 She won several awards and edited poetry journals, including the Columbia Journal of Art and Literature and AGNI. Her curiosity about how a particular culture affects people's evolving personal lives plays out in her poems, too. Her interest was piqued when she came across a retrospective of the first American abstract painter, Arthur Dove, which led Potts to delve into his relationship with the American Modernist painter Helen Torr, both spouses of others at the time, but eventually married to each other. "Here were two painters, one male, the other female," notes Potts who studied Torr's letters, now archived at the Smithsonian. "It's about the tension of women wanting to do their own work, while men have ancient expectations," Potts said. "He shot ahead. He sold paintings. She sold just one or so. She did all the framing of his paintings. In the end, Torr quit painting herself, and was institutionalized. From there, she'd write letters saying things like, 'I'll try to be better, and help him more.'" Some of Potts's poems are about the couple's life as she imagined it through the letters she'd scrutinized. 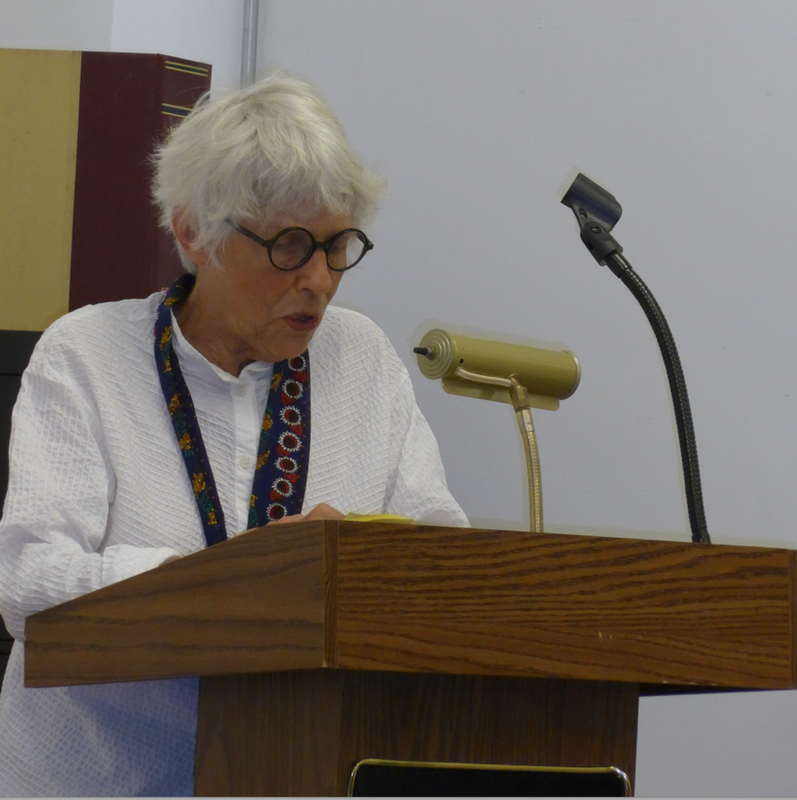 She read aloud several poems from her collection Porthole View, inspired by the Dove/Torr relationship and their time spent living on a houseboat in Long Island Sound, including Gull with Telephone Wire, Flotsam and Tennis Ball over Gramercy Grass. And, at the request of a library audience hungry for stories about their beloved neighborhood, also one chapter from Faces, the interview with Sebastian Alonso, of a Cuban-Peruvian immigrant background, who grew up on Shawmut Avenue in the 1980s and 1990s, and had been part of a gang.